What if the ways you have always done things are not sufficient for meeting today’s healthcare challenges? With a focus on creating work environments and cultures that align with the delivery of safe, efficient, and patient-centered care, participants will gain a heightened understanding of the correlation between how team members are treated and the quality of the results they achieve. 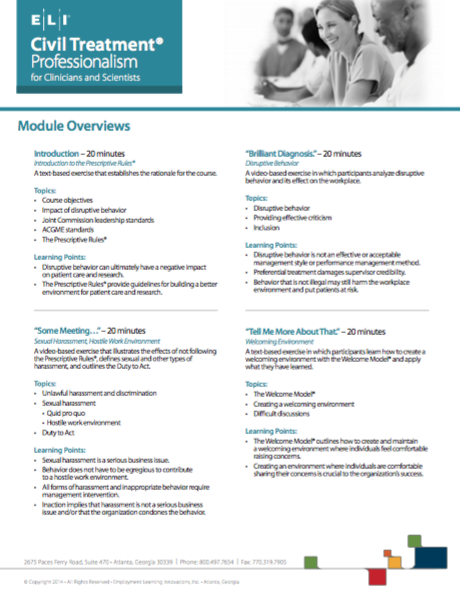 With an emphasis on sustainable behaviors and patient outcomes, this interactive, case-study-based program gives participants skills and practical insights for effectively collaborating to identify, assess, and resolve issues. Importantly, the program equips clinical and healthcare leaders the skills and insights they need to positively engage employees and achieve their mission. "Because the participants (in this course) represent a diversity of specialties and experiences, the open discussions (in this course) provide an opportunity to share a variety of perspectives that frequently illuminate the range of unprofessional behaviors and the responsibility of colleagues and bystanders to speak up." 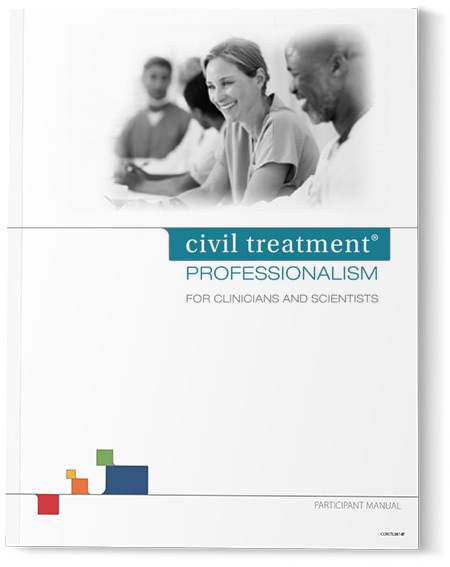 Civil Treatment Professionalism for Clinicians and Scientists is a dynamic and interactive two-hour learning solution that engages participants in active conversation. This program is delivered by one of ELI’s professional instructors or your own ELI certified instructors.